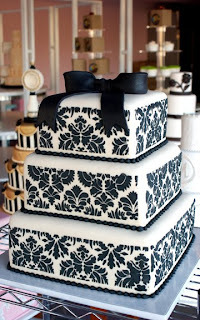 Black and white wedding cakes with square tiers and damask pattern. 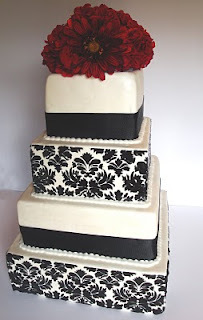 Pure elegance - five tier damask pattern wedding cake with red roses on the top tier. Simple four tier white wedding cake with damask motif. Elegant three tier square wedding cake with damask pattern and black satin bow on top. 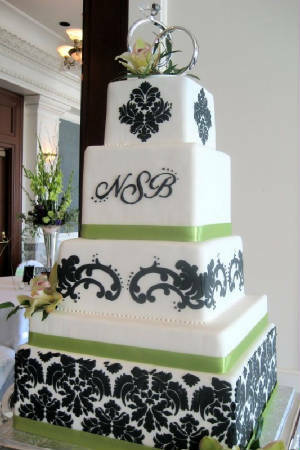 Lovely three tier wedding cake with inverted damask pattern in the middle tier to add contrast and style to the cake. 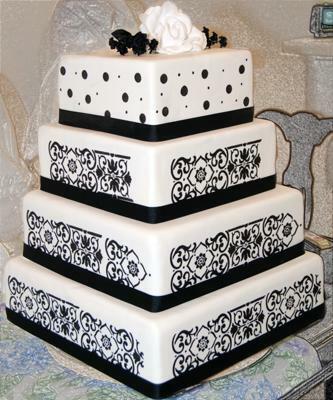 Four tier black and white damask wedding cake with dotted pattern on the top tier. 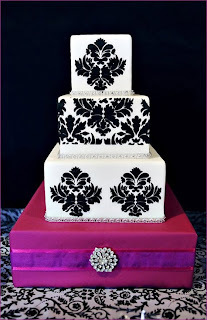 Exquisite four tier highly patterned black and white wedding cake with light purple roses on top. Elegant four tier wedding cake with damask pattern and wide black satin ribbon. Blood red gerbera daisies are the crowning glory of this wedding cake. 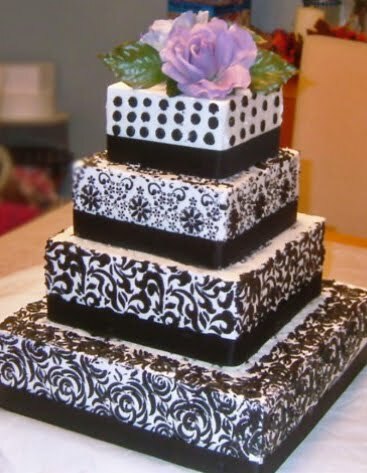 Sophisticated three tier square wedding cake in black and white with pink lilies on top. 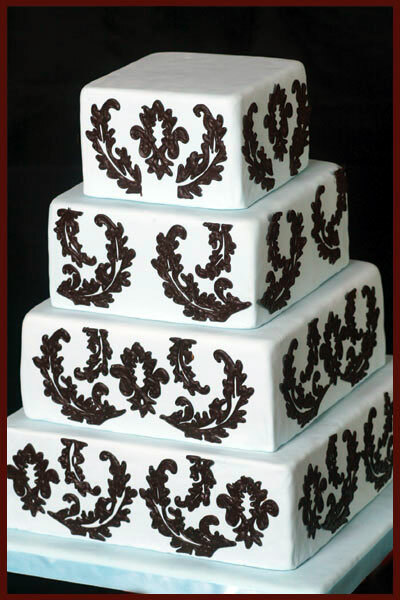 Three tier classic damask pattern wedding cake with diamonte bands separating the tiers. Four tier wedding cake with all square tiers on different angles and with varying black and white patterns. Lovely four tier black and white damask wedding cake with green satin ribbon. where can you buy the damask pattern? what happened to the top cake? 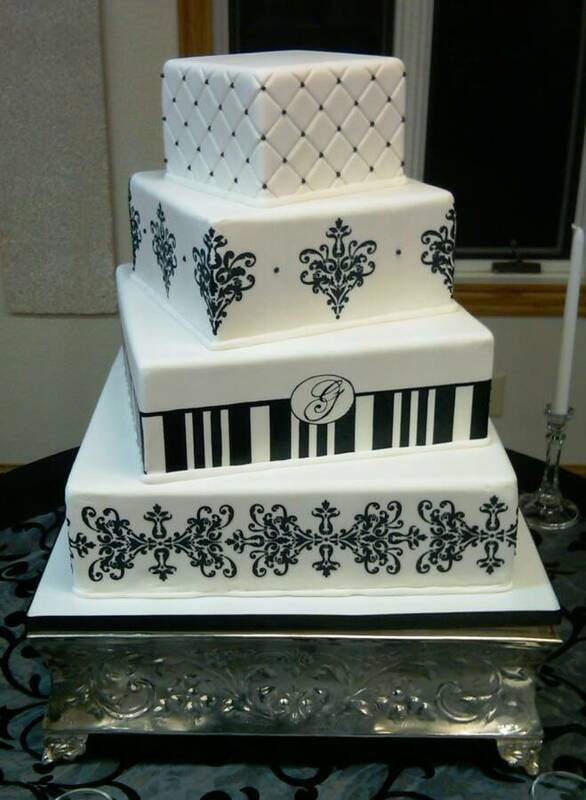 It is leaning really bad?